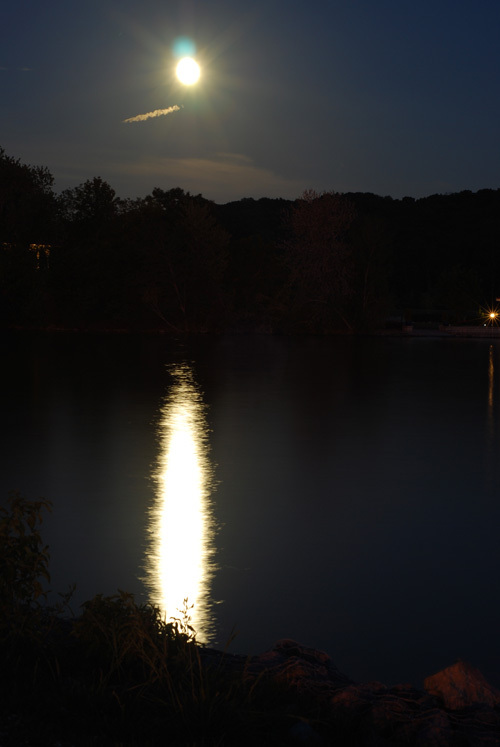 Did you see the Supermoon last night? We went to the lake with my parents who are visiting and watched it come up. Earlier this week dinner needed to be easy because I had a bunch of things to do and Alexis was working late. 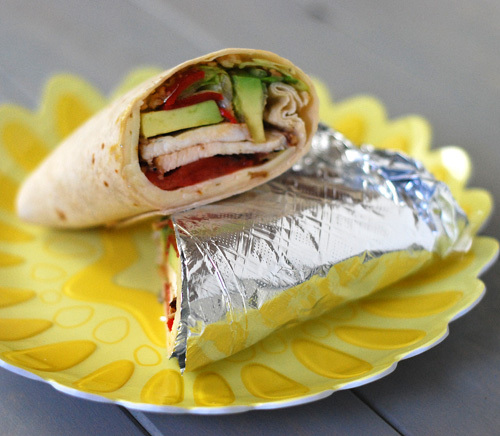 I took the opportunity to try out a few things and throw them all together in a spicy grilled chicken wrap. Turned out to be one of our favorites. No real recipe needed for this one. 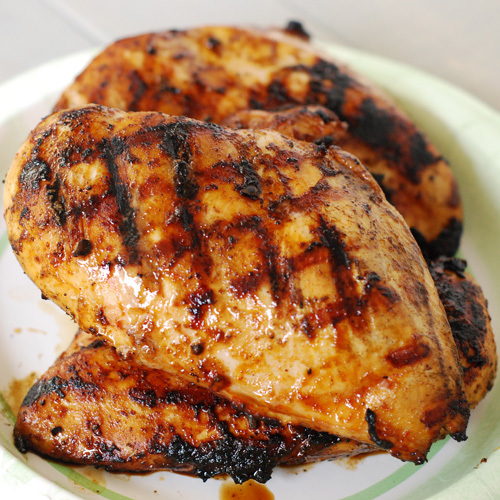 Grilled some spicy chipotle chicken breasts about 6-7 minutes a side at 350f until it reached an internal temp of 160f. Sliced the chicken breast. 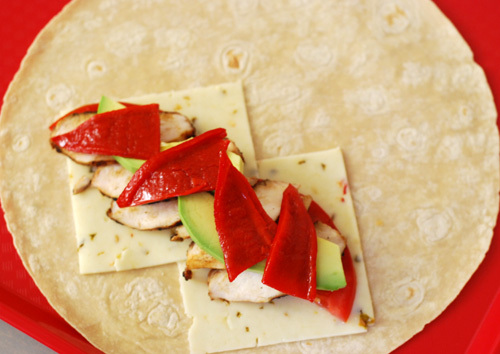 Then on a sour dough wrap, I put a few slices of pepper jack cheese, thin sliced tomato (lightly seasoned with salt), chicken, avocado, and roasted red pepper. Always cheese slices first. 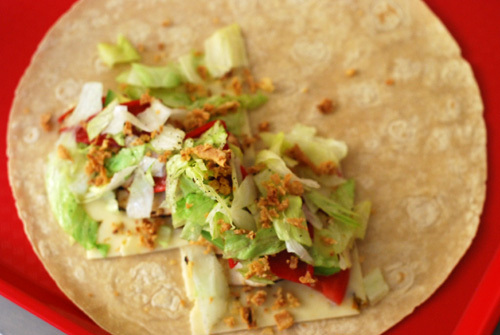 Think of them as a "moisture barrier" to keep the other ingredients from making the wrap soggy. Topped that with seasoned lettuce and fried onion bits. Then rolled it all up burrito style and dove right it. It was one of our favorite wraps that I've made and had a lot going on in it. The spicy chicken and cheese were balanced by the cooling lettuce avocado. The fried onions added a surprising extra layer of texture. 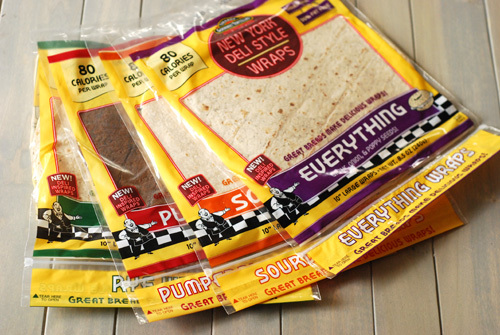 I received a sample of these from Tumaro's Gourmet Tortillas and wasn't expecting much, a wrap is a wrap. Wrong! The flavor is absolutely noticeable. They take traditional deli bread flavors like pumpernickle, rye, and sour dough and pack them into a thin wrap. My favorite was the cracked black pepper flavor, which I used to make a grilled bean and rice burrito. The "everything" flavor to be a close second, similar to an "everything bagel", every flavor took on a slightly different flavor combination. We also did things like a BLT on rye. The only variety that I didn't care for was the pumpernickel, only because it seemed super fragile and tended to break or tear instead of bend. We didn't have that issue with any of the other flavors. 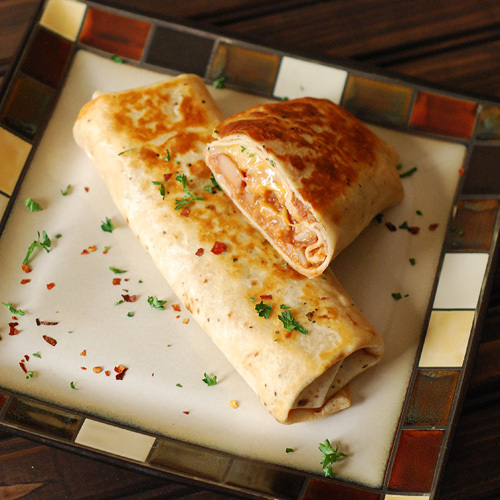 Overall a very good product and much different that your ordinary tortilla! This actually wasn't the marinade I was looking for. I was looking for Weber's new Just Add Juice line of marinades that sounds very exciting. I've been a customer of Weber Seasonings for years. Yep, the same folks that product the iconic Weber grills and smokers. I particularly like their Kick'n Chicken seasoning and Gourmet Burger spice mix. Unfortunately, the Just Add Juice line hasn't hit the Knoxville market yet. Hopefully soon. 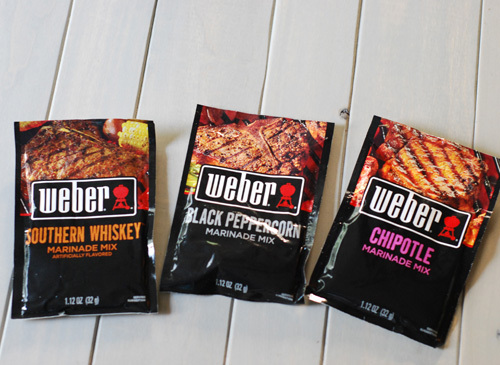 But I did find this set of Weber instant marinades at Food City and at $1 a pack, I couldn't resist buying all three. Upon opening the Chipotle mix, I could see the red chunks of chipotle in the marinade mix and could smell the hint of smokiness. The instructions are simple, mix with water, oil and a hint of citrus. It boasts a marinating time of 15 minutes but I let mine go for an hour. I was very happy with the final result. The marinade cooked on well, leaving a tangy, spicy coating that you can see in the picture at the top of this post. No sauce was used, just the Weber marinade. A definite winner for me. I got an email from the Loeb's Onion Crunch folks a while back but never took them up on their offer of a free sample because I thought, "Meh - fried onions, I can buy Durkee's at the store." Face palm. Turns out these are NOT like Durkee's. I saw them at Food City and decided to buy it and try them out. This are crispy little bits of fried onions. You know how Durkee's are a little...."soft" straight out of the can unless you bake them? 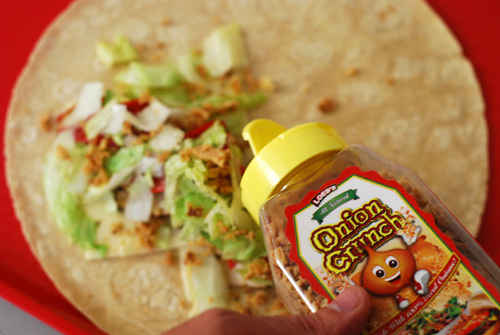 Not Onion Crunch. They are crispy and ready to rock and roll. 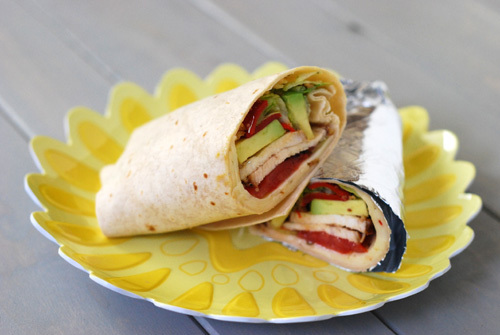 Even used in this wrap with some damp ingredients, they held their texture and ABSOLUTELY added something to the dish. Can't wait to try them on burgers. Be forewarned - these are addictive and it is hard to stop eating them straight out of the jar. [Standard Disclaimer] I received free samples from Tumaro's Gourmet Tortillas.